After playing Forza for a total of 38 hours (plus about 20 drivator hours, they don’t count) over the last 55 days, I have finally finished it! That’s something I wasn’t able to accomplish last time I owned it because of the very difficult final race. If you want to benefit from my progress, feel free to Download my profile and put it on your own system. You’ll need your HDDKey (you can get it with this program) and mine (it’s 82df15713d96a034e0f9c6b222bc80d1) and this program to transfer the profile to have it work on your system. 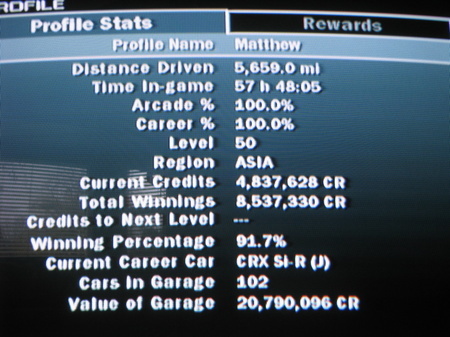 After that, you’ll have a completed game, with a bunch of money and all the cars available.